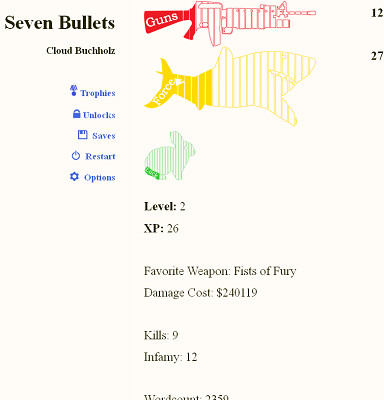 My wife had a look at Seven Bullets, a choose-your-own-adventure book by Cloud Buchholz, about a year ago. The review was still filed under “Books”, as it was just that – an e-book. However, Cloud’s work has nowadays evolved in what could be called a full-fledged game, and I’ll review it as such (I have set the precedent already). The man has ported it to PC using Twine, and it’s available for free online, as well as being sold on indie game portal itch.io for a measly $4, if you want to support the author. The meat of Seven Bullets is, of course, in the book itself – the Twine additions like achievements, unlockables, and more complex scoring, are mostly icing on the cake, but they’re still nice and giving a little extra incentive to look for the numerous alternate endings. And there are so many, and so different potential outcomes to this seemingly standard story. Don’t judge a book by its cover, as they say. Seven Bullets is a very solid CYOA. I have to say it’s among the best I’ve played, and I think I’ve played over 50 – they were all the rage here in the early 90s, when I was a kid. What I like the best about it is the unpredictability of the overall story, which contrasts the occasional predictability of individual situations and decisions you need to make in them. This is quite precious because usually in games you follow a preset path, with slight variants depending on your decisions. Here, a single decision can alter the whole story completely and send you on a path drastically different from the one you came from. Combine that with good storytelling and plenty of unexpected twists (even if the characters themselves leave a lot to be desired), and you’ve really got a great CYOA game in your hands. Seven Bullets starts like many action movies from the 80s or 90s… You are a criminal, and your boss has kidnapped your sister for some reason (that you will eventually find out – if you make the right decisions, of course). You need to save her. That is your driving force throughout the game. The relationship between the main character and Gillian (that’s the sister’s name) is quite straightforward – you love her and care for her, and she’s always concerned for your safety and the dangerous path you’ve chosen in life. And that’s where the straightforwardness ends. Once it all gets going, it’s quite the crazy ride! Science, technology, mysticism, religion, this game has got it all! There are situations you will be quite familiar with, as well as ones that will take you completely by surprise, and you’ll wonder, sometimes for minutes, how the hell did things suddenly turn out that way before you can continue. At the end, it’s all worth it. The biggest strength of the game lies in that unorthodoxy, in the story taking wild turns and pushing you to think outside the box. Often, you’ll find satisfaction even in less-than-perfect endings, and that is quite something in a CYOA. 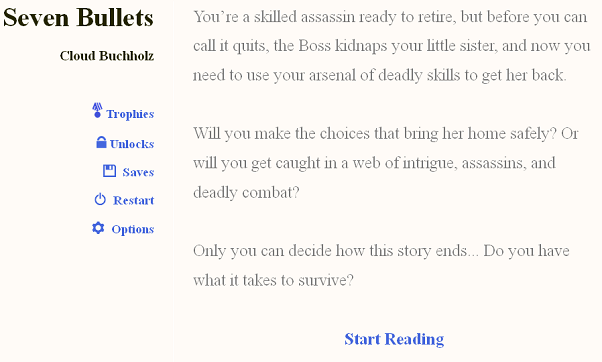 The gameplay of Seven Bullets isn’t much different from what you’d expect from a CYOA book. At the end of each reading passage, there’s a choice to be made, with 2 or more options available. You pick one and see what happens then. That’s all there is to it. You do gain experience and levels, as well as points towards various parameters/abilities like “Force”, “Sly”, “Guns”, “Melee”, etc. (and there are even counters for kills and collateral damage), but those don’t really do anything except affect the scoring you receive once you’ve reached an ending. They do not affect your characters’ performance during the adventure itself, only your choices do. And remember – even if usually the obvious choice is the correct one, that’s certainly not always the case. The game has incredible replayability – by the time you reach one of the many endings (there are over 80), you’ll be wondering what if you’d made another choice a bit earlier. And quite possibly, it would’ve changed everything! Once you reach an ending, if you made the right choices, you’ll unlock some stuff. 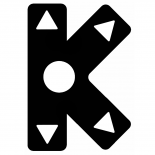 There are different unlockables, from animated gifs to short stories for your reading pleasure. But you’ll never be able to unlock everything in a single playthrough, so completionists, be prepared to go through this several times. Quite likely, each one will be like a brand new adventure because Seven Bullets is so massive. The same goes for the achievements/trophies – they are very similar to ones you’d see in games on your PlayStation or Xbox, and you can’t get them all on a single playthrough. And while achievements are always superficial in nature, I’m sure most gamers would agree they are nice to have. Seven Bullets is, in essence, literature. That’s where its artistic merit lies. Aside from the cover, you won’t see many illustrations in the book – as with all good books, most is left to your imagination. The author’s ability also matters quite a bit here. Cloud Buchholz may not be a critically acclaimed, best-selling author, but he does the job well enough in Seven Bullets. His writing style is straightforward and to-the-point, the action is prevalent, with some concise, but clear enough descriptions of the environment. It is very appropriate for a CYOA. The man’s love for the many CYOAs he’s read in his childhood is quite apparent, and it gives the game an extra feel of nostalgia. As a genre enthusiast, I appreciated it. I cannot help recommending Seven Bullets to CYOA fans. It is a true tribute to a genre that is seeing a tiny renaissance nowadays, thanks to the Twine engine. But again, Seven Bullets was merely ported to Twine – it was not the existence of the tool that urged Cloud to create the game, it was his own creativity and passion for CYOAs. 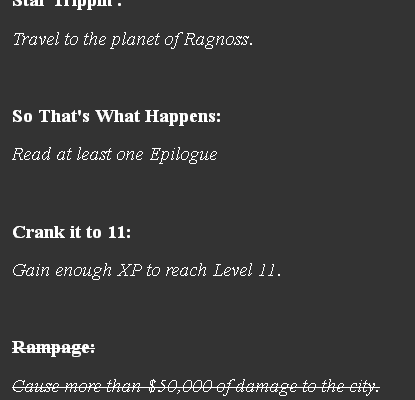 Twine merely allowed Cloud to add some extra fluff to the CYOA e-book he’d already written. The essence is not really in the unlockables or trophies that Twine allowed for, it’s in the author’s original writing. Seven Bullets starts in a rather familiar way, but doesn’t take too long to become unorthodox. The main strength of this game is exactly the wild imagination of the author, and his willingness to stray from the well-trodden path and provide us with an unpredictable experience that represents his own vision. Game and book enthusiasts alike can find Seven Bullets enjoyable. I certainly hope Cloud goes on to do what he loves, and creates more thrilling CYOAs for us to enjoy.